How can light curtains improve safety & performance? As passenger elevators started incorporating automation equipment, the number of litigations increased due to the injuries caused by opening and closing elevator doors. As a result, the elevators became equipped with more sophisticated and intelligent mechanical safety buffers to obstruct operation as soon as a contact is made with an object. To meet the growing obstruction needs, light curtains were developed, offering a way to detect presence before any physical contact with the machinery was made. Today, light curtains have a utility that extends beyond small-scale use, making it a necessary in industrial plants to prevent any damage in work areas. Infrared light is the prime source of beam to create a field of safety across the selected area or the machine. The part of the light curtain that generates the array of beam is called a transmitter. When the transmitter’s path is interrupted, a signal is sent to the receiver which in turn operates a relay or associated circuit. As the workplace becomes more complicated, so does the requirements of the associated equipment. All products are not the same as there are a number of differences when it comes to installation of components and their functionality. In addition to a response time, depth penetration factor is also an important factor for a light curtain. Depth penetration factor is significant in situations where a worker may interrupt the curtain a certain distance before being detected. This certain distance must be considered while making calculations for minimal safety distance for the machine. Furthermore, the level of safety and reliability provided by a light curtain should also be top-notch if it is to improve the overall productivity of an industry. Dual channel outputs to the emergency circuit can prevent any failures while the end-point relays should be as responsive as the light curtain itself. ABB Jokab light curtains are a prime example of breakthroughs in optoelectronics. 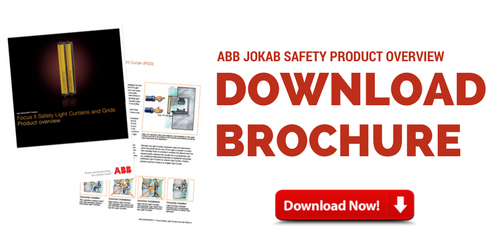 Safety requirements have already been set by the concerned authorities for such equipment like EN 61496-1, all of which are met by ABB Jokab’s light curtains. The company packs a wide range of light curtains and grids with multiple safety features, covering all kinds of workplaces such as those requiring vertical safety curtains and horizontal safety curtains. On top of all this, light curtains are extremely easy to install, packing all the instructions, cables and supplementary hardware. In conclusion, it is evident well-designed light curtains and light grids can improve a plant’s safety and performance as manual tasks can now be performed without risk of injuries.